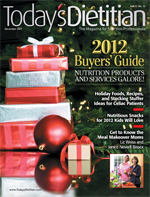 Even though the holiday season is still in full swing, this year is quickly coming to a close, and parents with either normal weight or obese children soon will look to you as nutrition professionals to give them healthful snack recipes so they can get a jump-start on a healthier new year. As you know, overweight and obesity is a nationwide problem largely stemming from poor eating habits, and children are increasingly bearing the burden. Data from the Nestlé Feeding Infants and Toddlers Study 2008, a comprehensive dietary intake survey involving parents and caregivers of 3,273 children from birth to 48 months, provide new insights into the evolution of children’s diets—and it’s not good news. Study findings show that children are starting to adopt unhealthful dietary habits as young as 24 months and by age 3 are already falling short of USDA MyPlate recommendations. What’s more, toddlers are consuming one-third of their daily calories in snacks that consist mostly of cookies, candy, and crackers, and the choices are becoming even less nutritious as they get older. Because the problem of childhood obesity is so widespread, RDs can’t solve this problem by themselves. Dietitians must work with parents on this issue to institute real change in children’s lives, says Shreela Sharma, PhD, RD, LD, an assistant professor of epidemiology and assistant director of the dietetic internship program at The University of Texas Health Sciences Center at Houston. “Given the challenges we’re facing with childhood obesity, it’s imperative that parents take it upon themselves to ensure they’re giving their kids the nutrition they need to prevent health complications later in life,” she says. To help parents provide more nutritious foods, Today’s Dietitian spoke with several dietetics experts who offer myriad creative healthful snacks parents can easily make at home or buy prepackaged to satisfy kids of all ages. Many of the snacks incorporate whole foods and are nutrient dense, convenient, and more importantly, will help children begin 2012 on a much healthier note. When it comes to nutritious snacks, fruits and vegetables are on the tongue of almost every RD because they’re chock-full of nutrients and low in calories. Kerry Neville, RD, a consulting dietitian at Safeway, always recommends incorporating a fruit or vegetable into snacks. Based on current fruit and vegetable intake recommendations, she says this is imperative. “Depending on age and gender, school-age kids need between 1 1/2 to 3 cups of vegetables and 1 to 2 cups of fruit each day. That’s difficult to do with breakfast, lunch, and dinner only, so snacks are key [opportunities] for parents to help kids get the fruits and vegetables they need every day for good health,” she says. Amy Marlow, RD, nutrition advisor for organic food brand HAPPYFAMILY, suggests sliced fresh produce for after-school snacks or just before dinner when kids are hungriest. Of course, it would help if parents made these whole foods more convenient and appealing to increase the likelihood of children eating such snacks, says Elaine Magee, MPH, RD, author of 25 books, including Tell Me What to Eat if I Have Diabetes, Food Synergy, and Comfort Classics: Hearty Classics Made Healthy. “If you put out raw veggies for munching and easy-to-eat cut fruit where the kids are playing or doing homework, it will disappear,” she says. Magee recommends edamame, baby carrots, celery sticks, cucumber slices, cherry tomatoes, grapes, and apple or orange wedges as options, depending on a child’s age. Sharma suggests clients top fruit slices with granola to jazz them up. She also advises clients to try Bob’s Red Mill or Kashi granola for lower-fat and lower-sugar varieties. Another option: Parents can experiment by making their own granola. Sometimes it takes even more creativity to increase the chances of kids eating vegetables as snacks. Mitzi Dulan, RD, CSSD, coauthor of The All-Pro Diet and owner of Mitzi Dulan’s Boot Camp, suggests clients make kale chips because of their nutrition profile. She says her kids love them. Andrea Dillaway-Huber, PhD, RD, LDN, of Spring Ridge Medical Center in Reading, Pa., says “ladybugs on a log” go over well with most children. Slice celery into two- or three-bite pieces, fill with peanut or another nut butter, and line with Sun-Maid raisins or Ocean Spray Craisins, and, voila, you have a great healthful snack. Sharma offers a healthful option that kids can help assemble: homemade mini pizzas. Spread tomato sauce on whole grain English muffins, add sliced tomatoes, peppers, and shredded cheese, and bake at 400˚F for five minutes. When homemade isn’t possible, however, you might want to suggest nutritious choices from the freezer. One such option is Dr Praeger’s kid-friendly snacks that include pizza bagels with part-skim cheese as well as sweet potato and broccoli “Littles,” a healthier alternative to French fries that comes in kid-friendly shapes. All parents need to do is pop these snacks in the oven. Sharma keeps nutrition bars handy “for the days when you don’t have time to assemble a snack.” Author and nutrition coach Tracee Yablon Brenner, RD, CHHC, agrees, adding that there are a handful of bars available that offer good nutritional profiles. Most RDs interviewed recommended bars made with whole foods, such as Lärabar, KIND, and Kashi. Liberty Orchards’ vegan and gluten-free Orchard Bars, made primarily from fruit, nuts, sunflower, and flaxseeds are also available. Another option when time is short: HAPPYSQUEEZE smoothies or homemade whole grain pancakes, which parents can make ahead and keep in the freezer for when they need a snack in a pinch, Marlow says. Guiding Stars nutrition navigation program advisor Allison Stowell, MS, RD, CDN, says she suggests Seapoint Farms Dry Roasted Edamame or its Goji Blend, due to its high-protein content. She also likes TERRA Original Exotic Vegetable Chips and FruitaBü Smoooshed Grape Fruit Rolls. Sharma agrees, adding that candy is a treat and should be given only on occasion. Two options for occasional candy: SunRidge Farms chocolate candy drops with no artificial flavors or Dr Dave’s Mega-O Vegetarian Chocolate Truffles, which have fewer than 80 calories each and offer a dose of omega-3s. For a more natural sweet treat, Sharma advises clients to add fruit snacks to incorporate that sweet taste. Another natural sweetener is honey. Sharma says you can spread honey on toast, sliced apples, or waffles to add sweetness. Another idea to help parents prepare healthful snacks is to suggest they shop in the produce aisle for fruit that’s in season. According to west coast-based nutritionist Rania Batayneh, MPH, owner of Essential Nutrition for You, eating seasonal produce is smart. “It’s more nutrient packed, as the food’s nutrients aren’t broken down by traveling across hemispheres, and it’s more affordable, due to fewer labor and transportation costs,” she says. For creativity, Batayneh suggests clients offer their children snacks of the same color and change those colors each day of the week. “For example, ‘Today is green day,’ and you serve broccoli and green apples as snack offerings,” she says. “This gets children excited about food and helps combine learning colors with healthful food.” Another example: Tuesday can be orange day when parents serve carrots and oranges slices. Tammi Hancock, RD, a consulting dietitian for Smart Balance, recommends clients take their children food shopping at the local farmers’ market. “Involving them in the shopping process will help keep them interested in trying healthful snacks and teach them how to make healthful choices in the future,” she says. • Winter: During the winter months, consider kale and sweet potatoes. “[These] can be hard sells for kids, but consider taking these vegetables and making crunchy veggie chips in the oven,” Massey says. Broccoli is also a winter veggie. “Steam [the broccoli] and drizzle a low-fat homemade cheese sauce on top, and have [the kids] whisk the sauce,” explains Diane Henderiks, a personal chef and culinary educator. • Spring: In the spring, berries are in season, so they tend to be more affordable. “They can be frozen and added to smoothies or homemade popsicles. Kids can choose fresh berries to make yogurt parfaits, fruit salad, or fruit kabobs,” Massey says. • Summer: The summer brings peaches, plums, and melons. Massey recommends adding peaches or plums to a fresh salsa mix as a dip for whole grain pita or tortilla chips, or “use melon with low-fat cheese for kabobs,” she says. • Fall: “Concord grapes are harvested in the fall and are packed with nutrition,” Henderiks says. Marlow suggests clients visit a local orchard with their children to pick apples fresh off the trees, then incorporate them into an afternoon snack. One last but important factor in choosing healthful, kid-friendly snacks is the child’s age. While Marlow says most healthful snacks are appropriate for children of any age group, consider sharing these ideas with clients. • Preschoolers: Massey says parents should always be aware of foods that may become choking hazards for young preschoolers, such as grapes, nuts, or hot dogs. “My favorite snack for preschoolers is plain yogurt swirled with applesauce or puréed fruit for added sweetness,” she says. Sears recommends buying prepackaged nutritious items that are easy to grab and go, especially for working parents. Dr Sears Family Essentials Popumz are one such example of an individually packaged snack that’s brimming with nutrition. Available in a variety of flavors, these whole grain crisps provide little ones with protein, fiber, and 100 mg of omega-3s. Freeze-dried Gerber GRADUATES Fruit & Veggie Melts are another way to get fruits and veggies into toddlers’ tummies. Various brands of squeezable fruit and veggie combos are also good choices, such as Gerber GRADUATES Grabbers, Peter Rabbit Organics fruit and veggie purées, or GoGo SqueeZ applesauce. Tina Ruggiero, MS, RD, LD, coauthor of The Best Homemade Baby Food on the Planet, says kids this age like things with eye appeal, “so be creative. Colors and shapes make food tempting even for picky eaters.” She recommends finger sandwiches for toddlers with various fillings, such as grated carrot and cream cheese or almond butter and honey. • Early elementary: “As children get older, you’ll notice they become more opinionated about their food intake,” Sears says. To sustain growing minds and bodies at this age, he recommends introducing more protein into the diet, such as lean meats, for long-lasting energy. Sharma suggests parents experiment with different flavors and spices. Try tacos with salsa and guacamole, such as Wholly Guacamole’s single-serve guacamoles or salsas for a portion-controlled snack. Children also might enjoy pita bread pieces with any one of Eat Well Enjoy Life’s hummus varieties. For another idea to make snacking fun, NutriFit founder Jackie Keller suggests using plain ice cream cones as alternatives to bread. “Scoop tuna salad, chicken salad, or cottage cheese into the cone and top with a cherry tomato,” she says. For a dose of whole grains, parents can buy Arnold and Oroweat 100% Whole Wheat Sandwich Thins Minis. They’re only 50 calories per mini, and teens can eat them as after-school snacks or use them for sliders or mini grilled cheese sandwiches. Because teens are often on the go with various sports and after-school activities, Batayneh says the convenience of having healthful snacks that can quickly go from freezer to oven can help with this age group. Batayneh suggests Veggie Patch Spinach Nuggets and Broccoli Bites with cheese. “They don’t contain artificial flavors or preservatives; they have 0 g trans fat and provide a half-serving of veggies.” Another freezer-to-oven option for teens with eclectic tastes comes from Tandoor Chef, which produces a variety of kid-friendly vegetarian naan pizzas and more. Sears says the examples parents set for their children are more powerful than any speech they could give them about healthful eating. — Juliann Schaeffer is an associate editor at Great Valley Publishing Company and a regular contributor to Today’s Dietitian. Sometimes packing a lunch that will be safe for a child to eat can be just as important as packing healthful foods. To ensure snacks stay at the right temperature, parents can purchase Zoo Lunchies’ insulated lunch bags. In penguin, mouse, and dog designs, the bags are free of BPA and phthalates. They’re approved for children aged 3 and older.